The much anticipated pitching match up in game 1 of the National League Championship Series ended with the younger of the two aces earning a victory, and the veteran came out of the contest already focused on redemption, but it was a late season addition from the waiver wire who became the star of the game for the Giants. Cody Ross shined, slugging 2 solo homeruns off of Roy Halladay, who was fresh off throwing the second no-hitter in MLB postseason history last week against the Reds. Ross was cut loose by the Florida Marlins and scooped up off waivers by the Giants, reportedly as a preventive measure, so that he would not end up with the rival Padres. As a Marlin earlier in the season, Ross was on the down side of Halladay's other big outing this season, his perfect game on May 29th. With one out in the 3rd inning, Ross ended Halladay's postseason hitless streak, delivering San Francisco's first hit and first run of the game, by smashing a solo homer to left field. The Phillies clapped back in the bottom of the frame against 26-year-old reigning Cy Young Award winner Tim Lincecum, as 8-hole hitters exchanged big flies. Carlos Ruiz got the Phillies on the board with an opposite field solo shot that tied the game at 1. 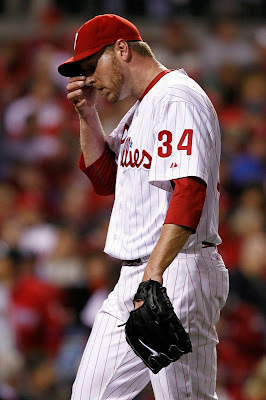 Ross returned fire in the 5th inning, taking Halladay deep for the second time in the game, putting the Giants up 2-1. In the 6th inning with and a runner on first base and 2 down, Halladay saw a close pitch called a ball by home plate umpire Derryl Cousins. FOX's computer-generated strike zone analyzer displayed the pitch as a strike. Burrell then went on to smack the next pitch deep toward the left field warning track. Raul Ibanez misplayed what could still have been the 3rd out of the inning into an RBI double. Halladay likely let the tough strike zone impact his focus, as Juan Uribe, who was a .221 career postseason hitter heading into the NLCS, laced a single that plated pinch runner Nate Schierholtz, and extended the Giants' lead to 4-1. "In the sixth, a couple pitches there cost me. At this point, if you make a couple mistakes they end up costing you," Halladay told the media following game 1 of the NLCS. Jayson Werth drew the Phillies back to within a run with a 2-run opposite field homerun that scored Chase Utley in the bottom of the 6th. But neither team would score any additional runs, and the Giants went on to lock down game 1 by a score of 4-3. Lincecum went 7 innings, allowing 3 earned runs and striking out 8 Phillies while walking 3 batters to earn the win. Ross' effort put his 2010 postseason batting average at .353 (6-for-17). He now has 3 homers and 5 RBI in 5 postseason games this year. The 2-homer performance even stunned Ross. "It’s been an unbelievable experience for me," Ross stated after the game. Prior to surrendering the HR to Ross in the 3rd inning, Halladay last gave up a hit to Washington slugger Adam Dunn, who led off the 8th inning against the Phillies on September 27th. Speaking about hurling a historic game in his first playoff appearance and then taking the loss in his very first NLCS game, Halladay who struck out 7 and walked none while allowing 8 hits over 7 innings said, "That’s part of it. You find out what you’re made of. You never obviously expect it to be easy. You grind it out and make adjustments next time out." Notes- Ross joins Will Clark, Rich Aurilia and Jeff Kent as the only San Francisco Giants to hit 2 homers in a postseason game. The Phillies have never won a postseason series in which they lost game 1. Brian Wilson, who earned a 4 out save in game 1 had a 6.43 ERA in 8 career games against Phillies prior to the series. The Phillies' big pitching trio of Halladay, Oswalt & Hamels now have a combined 1-5 record against the Giants this season. The Phillies are batting .212 in their 4 games this postseason. Follow PhoulBallz.com on Twitter by clicking HERE. Yankees Fans Effect Team's Shot at Landing Lee? Phils Drop Game 4, Mismanagement to Blame?